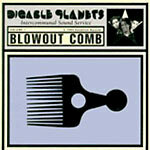 There's a few reasons that Digable Planet's sophomore album "Blowout Comb" is one of my top 10 favorite hip-hop albums ever made. First and foremost, the mix of jazz & hip-hop, in my opinion, is one of the most organic and natural mash-ups of two genres I've ever heard. And one could argue that "Blowout Comb" is the purest mixture of these elements. Fresh off of the grammy-success of their debut "Reachin' (A New Refutation of Time and Space)", DP hit the studio again to release their most artistic vision of their painfully short-lived career in 1994. Their artistic vision is considerably richer on their sophomore effort, although it never reached the commercial heights of their debut. The production, which favors live instrumental jaunts and free-flowing jams that relate to everything from pop-jazz to the pureness of bop, is simply superb. Much of that is thanks to King Britt's exquisite vision as the group's producer/DJ. The production is a marked improvement here, as well as the rapping from Butterfly, Doodlebug & Ladybug Mecca. Their content is sharper, consciously sound, and their flows are more remarkable & focused than ever before. Ladybug Mecca in particular is arguably my favorite female rapper in the game (skills and looks...lol), and Doodlebug as well as Butterfly more than hold their own under a blanket of originality. The album never lulls. In fact, as it moves, it feels as if it only gets stronger throughout it's 62-minutes in length. Two of the most superb cuts are stuck on the end - the chart-hitting, James Brown inflicted "9th Wonder (Blackitolism)" & the 7-minute anthem "For Corners". "Dog It" is a favorite due to the absolutely lush horn samples. "Dial 7 (Axioms Of Creamy Spies) / NY 21 Theme" featuring Sarah Anne Webb also enjoyed some well-deserved time on the charts. The guest choices are also fantastic. Guru shows up on "Borough Check", and Jeru The Damaja shows up on "Graffiti" - both excellent tracks that never detract from the album's golden feel. "Jettin'" is also a favorite, and it's just one of roughly five time Bob James is sampled here. Nothing here feels out of place in the least. Ultimately, the more politically-charged & Afro-centric vibe's that "Blowout Comb" held over "Reachin..." may be the reason it didn't enjoy the mainstream success of it's predecessor. Artistically, the Planets prove they are no fluke, and "Blowout Comb" deserves any and all recognition it receives as being one of the finest hip-hop albums ever made. Classic. Pure and simple.